Debris doesn’t stand a chance with Rake-O-Vac®. Leaves, clippings, litter, even pine needles. 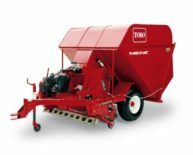 The Toro® Rake-O-Vac® provides the only combination of precision pickup and powerful vacuum in one sweeper. A premier performer for premier results in wet or dry conditions. The Flex Tip Reel has six rows of flexible nylon teeth supported by eleven spring loaded sets that provide the `kick` for an extremely clean pickup. They work like fingers to gently lift debris, wet or dry, then vacuum it into the hopper. A large capacity hopper of 4.4 m³ provides the ability for large collection before needing to dump.